​​Kevin Durant's pending free agency has been a talking point all season long. And the team that everyone seems to link him to again and again? The New York Knickerbockers. After trading away their only real star in Kristaps Porzingis and clearing all that cap space, the Knicks made it clear to the rest of the league that this upcoming offseason was going to be a big one for the franchise. And right on cue, a poll of 109 NBA players published in The Athletic by veteran scribe Sam Amick strongly believes KD will be doing his thing in MSG next season. The Athletic polled 109 players to find out where they think Kevin Durant will be playing next season. Bringing in someone of Durant's caliber would certainly make the Knicks an instant sensation. For a team that's been fighting for relevancy for years now, the man who's won the last two Finals MVPs goes a long way in changing that-- especially if he's paired with a guy like Duke phenom Zion Williamson or pending free agent Kyrie Irving, who's also been linked to the Knicks at various points this season. Aside from all these players thinking Durant is most likely heading to New York next season, it seems to be the consensus among fans and pundits as well. 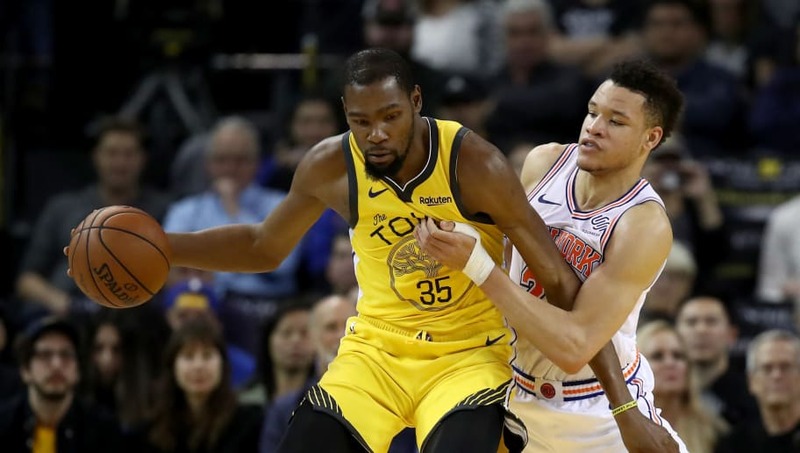 Going from the Bay Area to the Five Boroughs would be a night-and-day shift for KD, who's only known championships since coming to the Warriors from Oklahoma City three summers ago. The Knicks haven't even been to the Eastern Conference Finals since 1999, but if there's anyone in the​ NBA who can help them climb out of the basement and back into the spotlight, it's ​Kevin Durant.